This event will cover how to find the right college wrestling program, what college coaches are looking for in a recruit, opportunity to meet and work with college coaches, understanding of LUDIS strength training for wrestling, techniques used by World & Olympic champions, wrestling nutrition, college combine testing, feedback, and information packets for college wrestling. Check out more information about the USA Wrestling Preseason Nationals here! Includes: All clinic activities, information being shared with college coaches and NCSA recruiting materials, nutrition packet, and clinic bag. Des Moines, IA 50309 Map It! 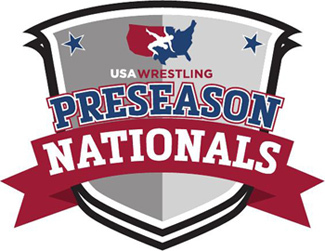 12:00pm - 1:00pm (Optional USA Preseason National Tournament Early Weigh-in) You have the option to do an early weigh-in for the USA Preseason Nationals on both Friday and Saturday. We are expecting over 3,500 entries. The time for this special weigh-in will be between 12:00pm - 1:00pm. The cost to weigh-in early is $30.00 per wrestler that you will pay when you register or at the weigh-ins. You can ONLY weigh-in early on the day your supposed to weigh-in. For example, 8th grade and below can NOT weigh-in early on Friday. Early weigh-ins will take place at Hyvee Hall.